Over the past while I've thinking about and looking around for a replacement for the civic. Nothing wrong with the civic, just lookin to move on to other things. Getting older, not crazy about moding my daily driver anymore. Anyways, the right deal finally just happen to fall into my lap this weekend. Not what I was initially looking for, but has all the features I was looking for. And when I saw it, that was it. 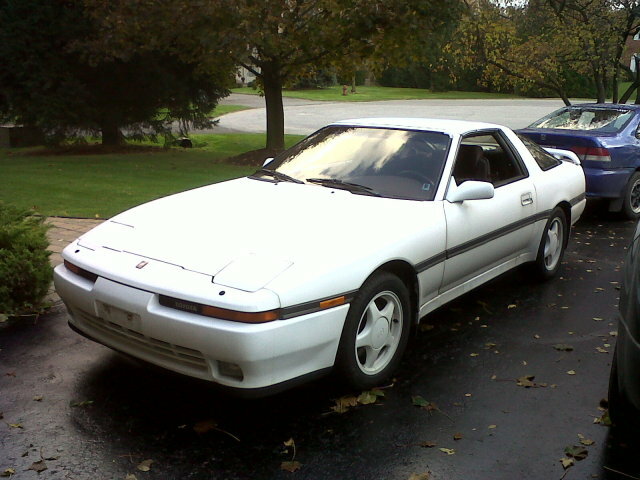 It's an 89 Toyota Supra (non-turbo 7MGE 3.0L I6) 5 speed, targa top with 225k. A/C, power everything. Almost zero rust. Came with a set of extra almost new snow tires. Everything works and needs next to nothing to certify. Everything is all original except paint, but it was painted the factory colour some time ago. Have to look real hard to tell. Went over it with a fine toothed comb today. Some of you may know the 7MGE engines in these cars ALL had head gasket problems which I'm well aware of. With this car there were zero signs of a blown head gasket which means it's either already been done or hasn't blown yet. It needs a valve cover gasket, so when I do that, I'll re-torque the head bolts which apparently fixes the head gasket issue. Compression was 180-190psi across the board. Last edited by MPR; 30-Oct-2011 at 09:14 PM. ^You don't know me very well...lol. The newest car I would ever own is a 2000. I do all work on my own cars and I actually prefer older cars for their style, character and because they're easier to work on. Those were always nice, albeit heavy as a boat. . . a bit boat. Does it have that sport suspension button or did those only come on turbo? Last edited by MPR; 31-Oct-2011 at 02:17 AM. It'll keep you busy. Good stuff! In for a boot when you slap on a turbo. Found out it began life as a US model, just like my civic. That means it does not have LSD (oh well), but it also does not have ABS which is good! very nice pick up Mike!i almosted picked up a black one this summer myself, but it ended needing more work then the guy said. Well the civic is gone. 6 years of good times. But, it's time to move on to other things. keep it out of boost and you wont pay for extra gas. i do agree turbo supra's aren't good for DD cars, even stock they seem to need lots of repairs. watched a few friends go threw this problem this summer. ^Yeah, just another thing to go wrong...lol. Now that the headgasket has been replaced, it feels like a new car. So much more power than before. I'm definitely quite happy and surprised with the performance, considering it's non-turbo. HELP! Car doesn't stay started without a jump, new battery, new alternator! !